As readers of this website will know, the Fund was granted charitable status at the end of January. The most obvious immediate result of this has been the change of name to The 82045 Steam Locomotive Trust, though the aims and objectives of the project are in no way unchanged. The principal benefit conferred by our new status is that we can now reclaim Gift Aid of 28 pence for every pound donated by a UK taxpayer on or after 29th January 2010, whether by lump sum or monthly standing order instalment. If you fall into this category but are not sure exactly what Gift Aid involves from your point of view, please don't hesitate to get in touch with Chris for a chat about it. You can download a simple Gift Aid declaration from this website (see under How to Help), and this should be sent to Barbara when you have filled it in - either by post or scan and email. In the past, a number of people have contacted us expressing concern that they might be financially liable should the unthinkable happen and someone get hurt (or worse) in connection with 82045. In these litigious times this is understandable, but please be assured that all members are completely protected: prior to our becoming a charity, the Fund became a company limited by guarantee in April 2009, which means that individual members' liability is restricted to £1. So, if you are still wondering about whether to join us, please be assured that you are quite safe - and, furthermore, that the taxman won't be able to get his paws on your hard-earned cash! Barbara is still trying to trace a number of new members whose addresses we don't have, since they set up their standing orders directly with their respective banks. Our bank is unable to help us find them, and Barbara is anxious to get in touch so that she can welcome them properly. If you are one of the above, please contact Barbara as soon as possible! Member Roger Hart (SVRA South East Branch) contacted a number of major retailers in November regarding the new Bachmann 82XXX model and asking if they would be prepared to carry a small stock of promotional leaflets, which they kindly agreed to do. The leaflets are now ready following confirmation of our charitable status, and Chris will be despatching them to the shops concerned in the next week and will list them by name in next month's updates. Phil Harvey has been busy recently making the U shaped straps which fit under the radial arm support stretchers to locate the king pins for the pony trucks. Sadly, once again the weather has intervened and the regular Monday gang had to abandon their day this week because of snow. A further pattern has been dispatched to Cheshire for storage pending casting when needed. 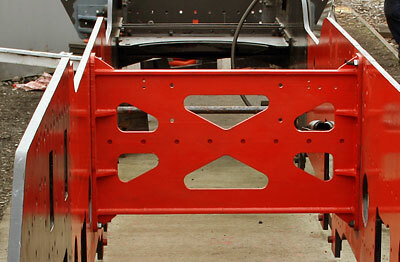 Thanks are due to Duncan Chandler for gathering the dimensions for the drawing from the identical Flexible Stretcher Bracket on the frames of 75069. Remarkably despite the availability of the vast majority of relevant drawings this particular one appears not to have survived. It is thought that this is because it is a LMS drawing in the D46 xxxxx range. Our members have responded well to our recent newsletter and many have returned raffle ticket stubs and of course that all important Gift Aid declaration. Any one wishing to buy raffle tickets (1st prize a 32 mile footplate ride on the SVR) please send a SAE to the membership secretary. Tickets are £1 each and come in books of 5. We are looking forward to the SVR Spring Gala March 5th, 6th and 7th - we will be well represented at each end of the line with publicity and sales stands and have some splendid new sales items - do come and support 82045. 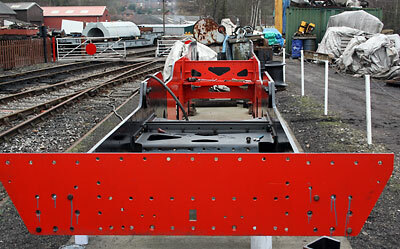 First of the vertical stretchers in place, viewed from the smokebox end. The latest shot of the frame assembly, viewed from the bunker end. Inside the shed - a few more stretchers! Two x radial arm support stretchers waiting machining. 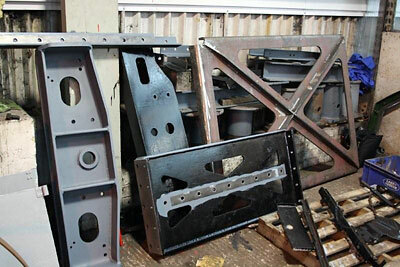 One vertical stretcher waiting to be fitted and one horizontal stretcher which is being sent away for machining as it is too big for the horizontal borer at Bridgnorth.